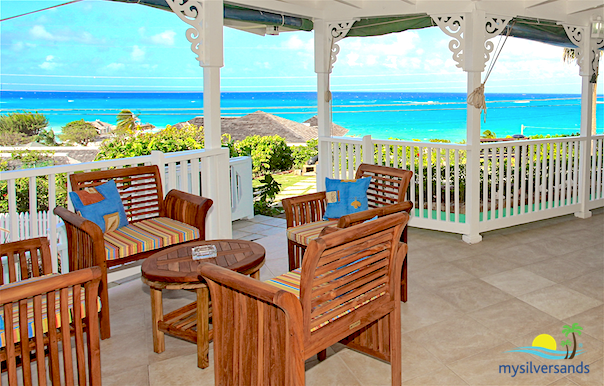 Image 1 of 14: The view of the Caribbean Sea from Windjammer is exhilarating. 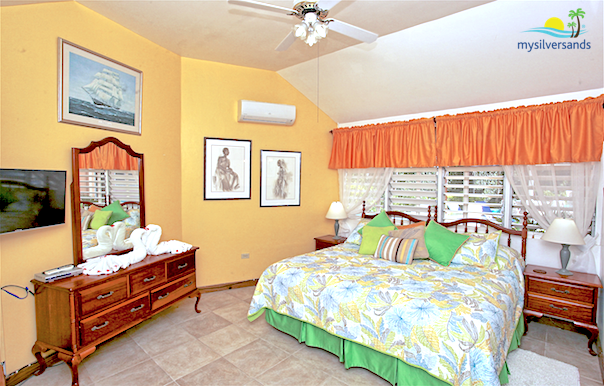 2 of 14: The living room of Windjammer Villa is comfortably furnished and beautifully decorated in a tropical theme. It's well ventilated with lots of louvre windows and there is also a ceiling fan. This is also the electronic entertainment centre with cable television, and a stereo system featuring double cassette deck, radio, and CD player. 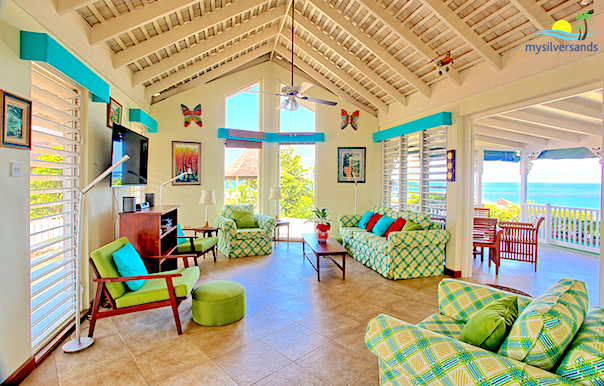 The living room opens out to the verandah with wonderful sea views. 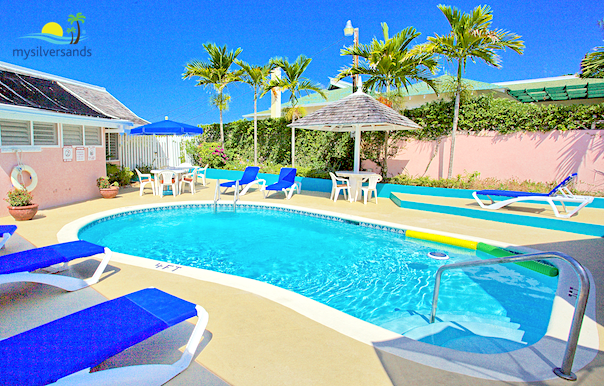 3 of 14: The swimming pool of Windjammer Villa is enclosed, assuring a great deal of privacy. 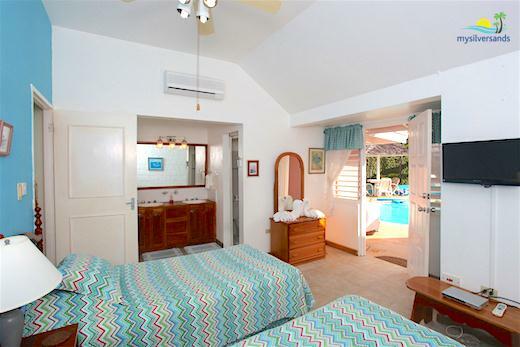 Bedrooms Two, Three and Four open to the pool. 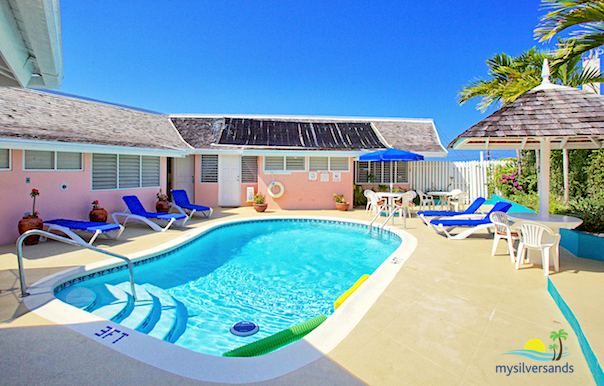 It is solar-heated to take that chill off the water in the cooler months, allowing hours of pleasure. The entire swimming pool area is a beautiful oasis with lush vegetation and flowering plants in clay jars. There is a barbecue, several tables for dining and lots of lounge chairs. 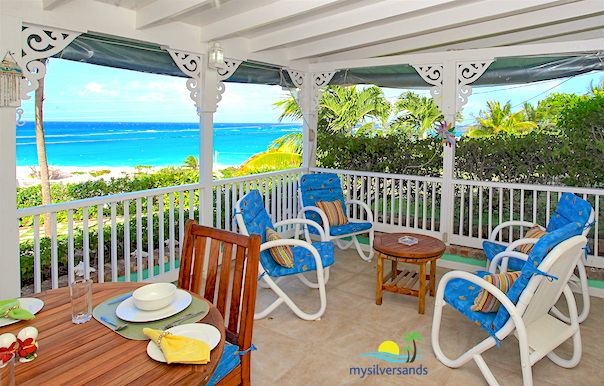 4 of 14: The large verandah is one of the favourite places to hang out when you are at the villa. It's perfect for dining as well. 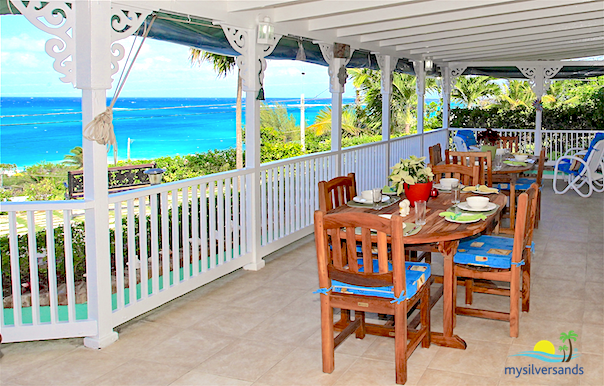 5 of 14: The Verandah runs along the North side of Windjammer providing a lot of space for large groups and magnificent panoramic views of the Caribbean Sea. 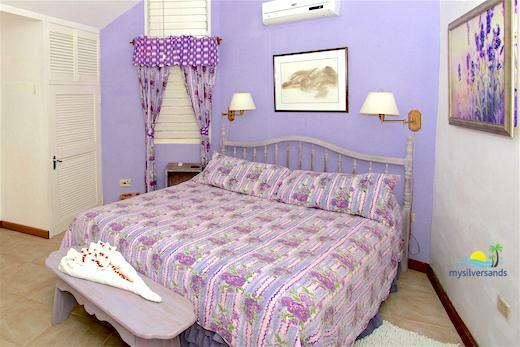 6 of 14: Bedroom One of Windjammer Villa is furnished with a kingsize bed. Double doors open to the verandah and view of the sea. The bathroom en suite features double basins. 7 of 14: Bedroom 2 is furnished with twin beds. It opens out to the pool which is located in an enclosed courtyard. 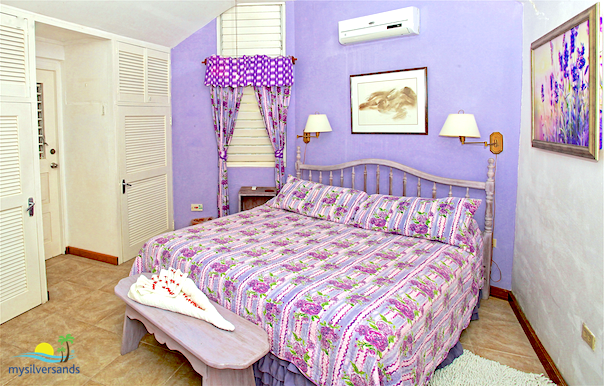 8 of 14: Bedroom 3 is furnished with a king bed and opens out the courtyard where the private swimming pool is located. 9 of 14: Bedroom 4 also opens out to the private swimming in the courtyard. 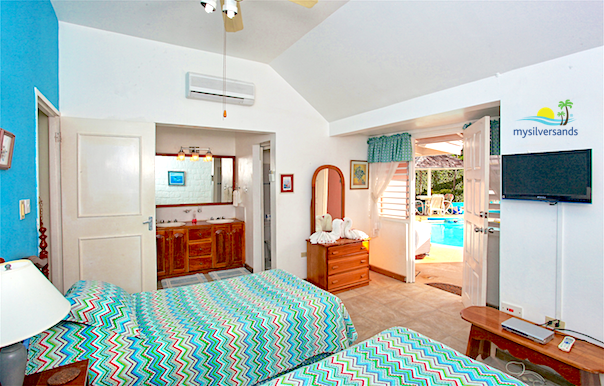 This bedroom is not connected to the rest of the villa, making it ideal for those who want to be a bit apart from the rest of the group occupying the villa. It is furnished with a queen-size bed. 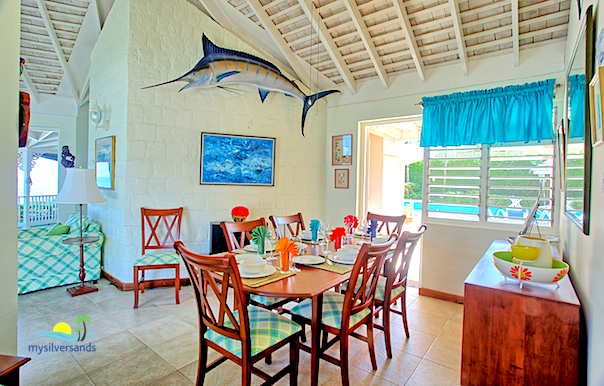 10 of 14: The dining room at Windjammer is located between the kitchen and the living room with easy access to the pool area. 11 of 14: There are always shaded areas around the pool for those times when you need respite from the sun. Closing the bedroom doors and the door from the Dining Room will effectively shut off the pool from the rest of the house - something to keep in mind if you wish to keep small children away from the pool. 12 of 14: Because the pool is completely enclosed, it provides a great deal of privacy. 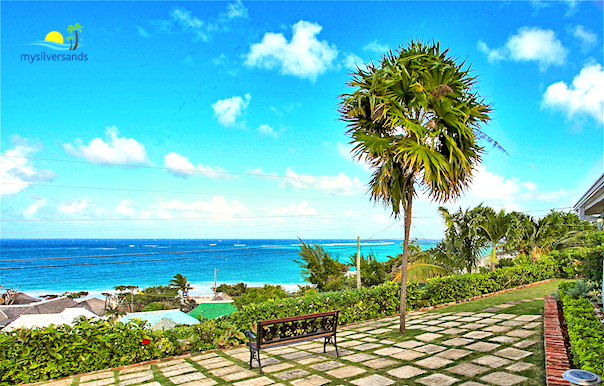 13 of 14: To the East and West sides of the Verandah there are comfortable chairs where you may relax and enjoy the view and cooling Tradewinds blowing in from the coast. 14 of 14: Relax on the Verandah. 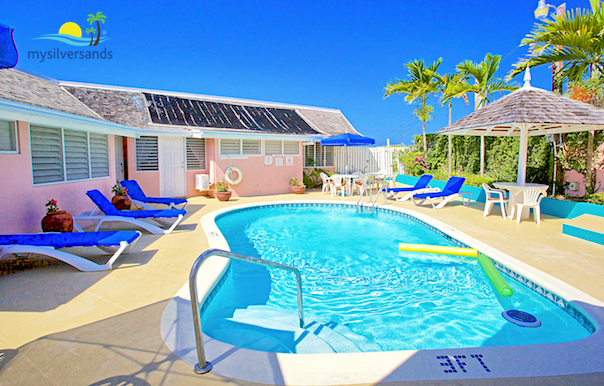 Situated just two minutes from the pristine Silver Sands beach, the gorgeous 4 bedroom Windjammer Villa has all the amenities you desire for that dream vacation. Surrounded by a tropical garden, the villa offers outdoor dining by the private courtyard swimming pool or on the front verandah where you can enjoy the soothing breezes and the fabulous panoramic sea views. Private swimming pool in an enclosed area. Large front verandah offering fabulous sea view. 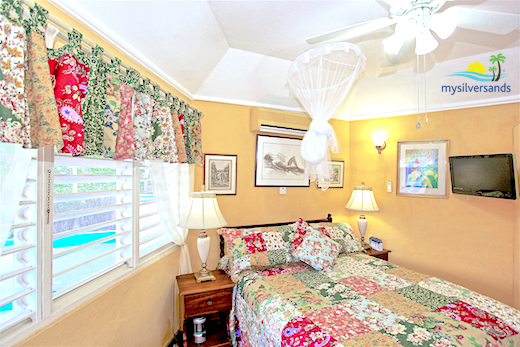 Very comfortable and well-equipped living room opens out to the breezy verandah. Equipped with Cable TV, and SONOS music system (wireless connection to your smart phone or tablet). Telephone. Beautifully decorated throughout in tropical theme. 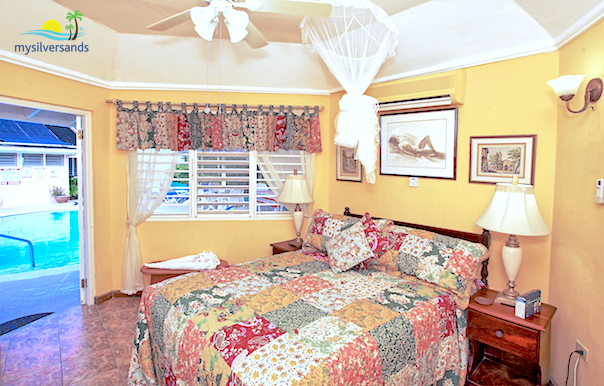 Every bedroom is spacious and comfortably furnished. 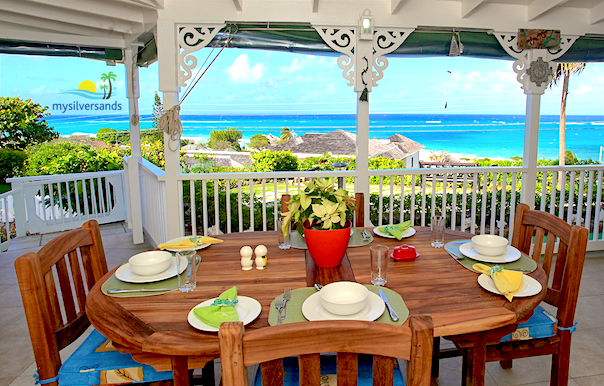 Outdoor dining poolside or on the front verandah. Dining Room adjacent living room with exit to pool area. Cook & Housekeeper, and Evening Cook/Butler who lives on the property in his own quarters, ensuring your privacy. In case of a power failure, a standby generator automatically trips in and powers the whole house. Wheelchair Friendly: There is a ramp at the entrance to the villa. 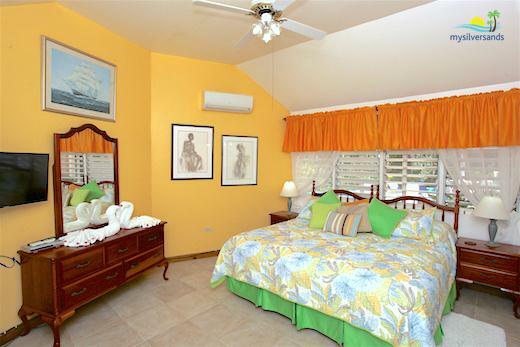 Windjammer Villa costs from $600.00 to $880.00 per night.